The Arabic word awama means a buoy or float which is used for swimming. Awaymet or awamet is the plural of the word. 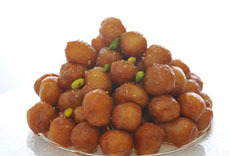 These balls are called awaymet or "floaters" in Lebanon because they float up to the top of the oil when cooking. In Egypt there is a different name, zalabiya. They may also say luqmat el qadi, which means "judge's mouthful". In Spanish this dessert is called buñuelos. They were brought to Latin America by the Spanish. The Spanish, in turn, inherited them from the Arabs during the Moorish rule in Al Andalus in southern Spain for many centuries. This recipe is the Lebanese version of this treat. Add the yeast to a cup of warm water with the teaspoon of sugar. Sift the flour, salt, and baking powder together, then add the yeast mixture. Beat well and add enough water to form a soft, loose dough. Cover and let stand for 3 hours to rise. Drop spoonfuls of the dough into a pot of hot cooking oil. The Awaymet balls will float to the surface and become golden brown when ready. Remove them and drain on a paper towel. To finish, while still warm dip in the syrup (see below) and stack on a plate as shown. Dissolve the sugar in the water and boil to make a soft, clear syrup. This should be until it thickens a little, but not too thick. Do not stir while cooking. Finish while adding the lemon juice and orange blossom water. Priscilla is a dancer of Lebanese heritage who enjoys researching the Golden Era of Egyptian dance. She owns a collection of more than one hundred classic black and white Egyptian films which is continually expanding. Priscilla has also gathered a large library of dance related articles and clippings from Middle Eastern magazines and newspapers, many of which she has translated from the original Arabic to both English and Spanish. Priscilla currently resides in Central America where she is a dance instructor.